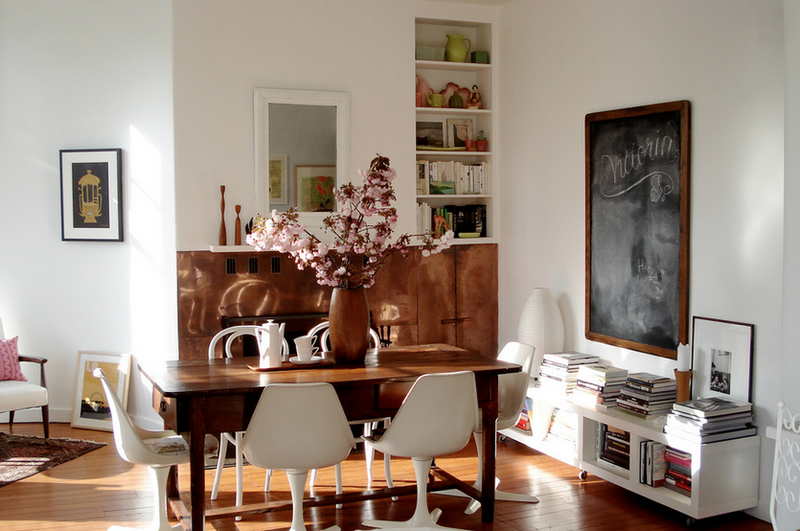 Whether because you and your partner have different styles, or because you love furnishing and decor from all eras, mixing styles does not need to be a battle. In fact, I often find transitional and mixed interiors to create the most satisfying "oooohhhhh" moments in someone's home. There are a few guidelines to keep in mind though, when mixing styles. A. Choose sides. Don't give styles equal love. 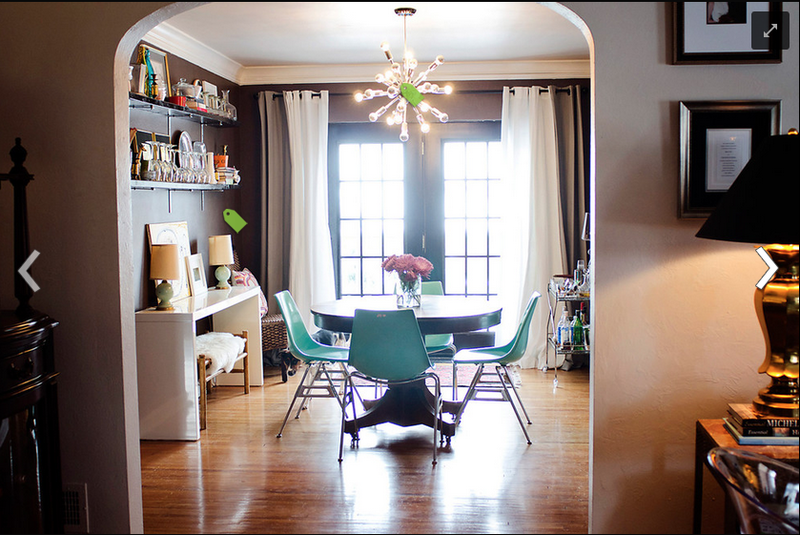 If you have an equal amount of mid-century mod pieces mixed in with your Victorian antiques, the space will not look harmonious, but rather just poorly designed. 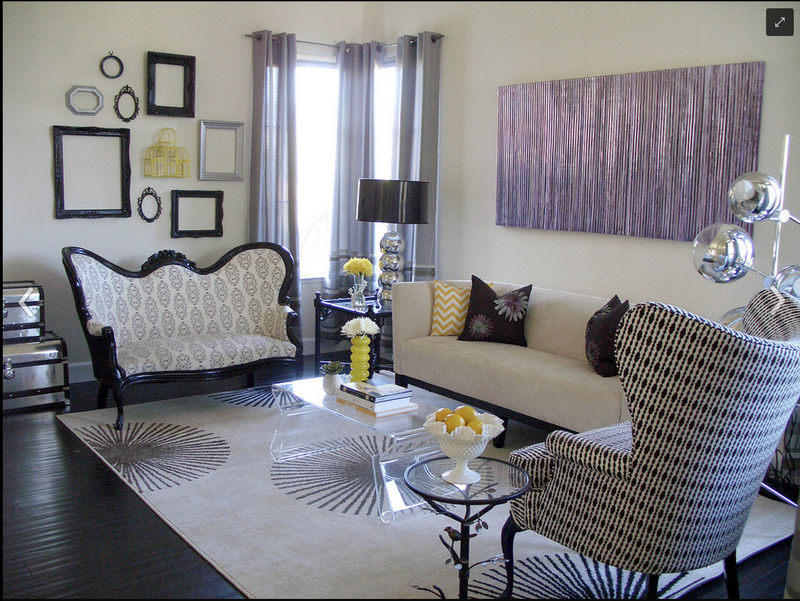 Pick one style to have more presence in your space, and use the other style for accent furnishings or accessories. 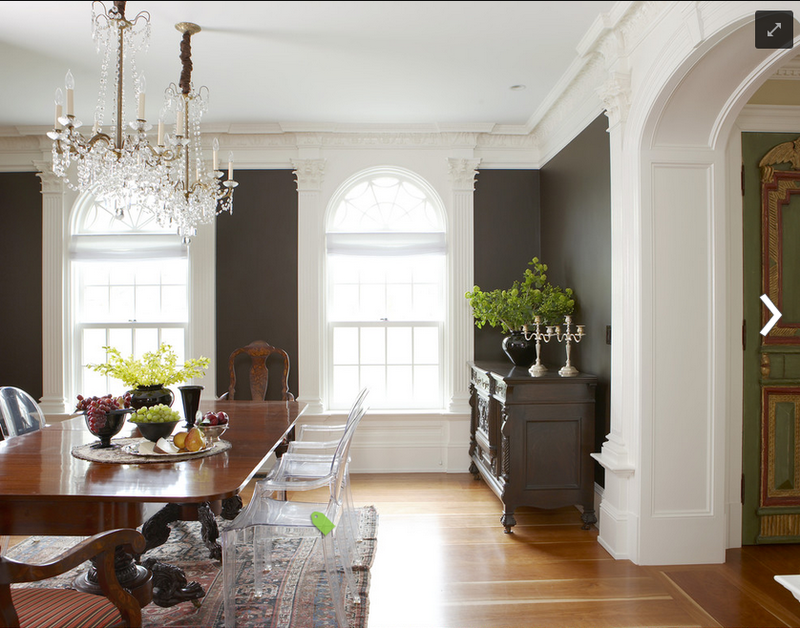 This dining room is a perfect example of the perfect "imbalance." The room is predominately mid century modern, with what appears to be a Japanese antique buffet, and Japanese prints on the wall. 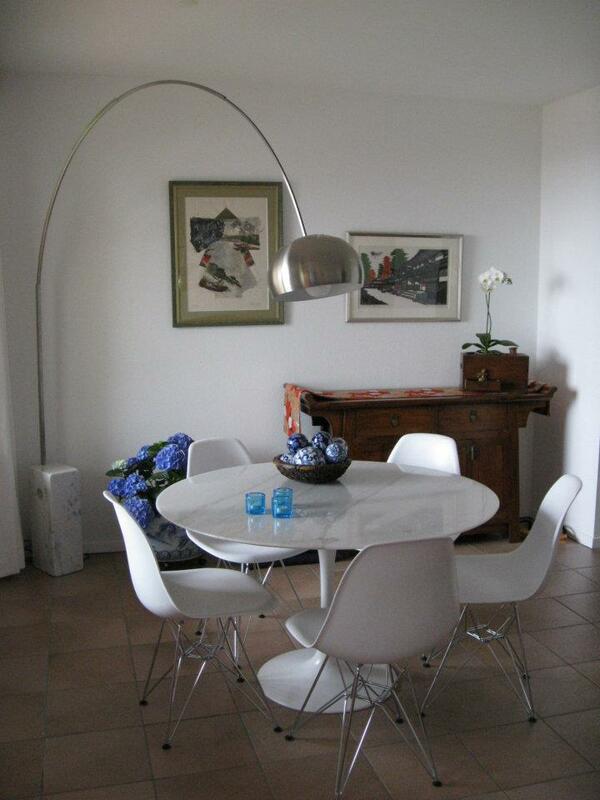 How cool is this Arne Jacobsen Egg Chair Ægget Stol in an otherwise traditional/country room? Different styles can get along! B. Change. 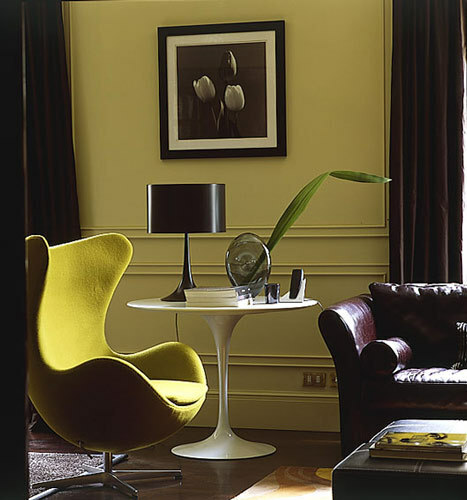 An unusual paint or reupholstery job can transform a drap victorian antique into a truly stunning contemporary piece. That doesn't mean you need to go kitschy with hot-pink for the wooden legs and arms or your wingback, but a glossy coat of lacquer and a more modern, bright fabric can make more traditional pieces a wonderful addition to a room dominated by modern furniture. 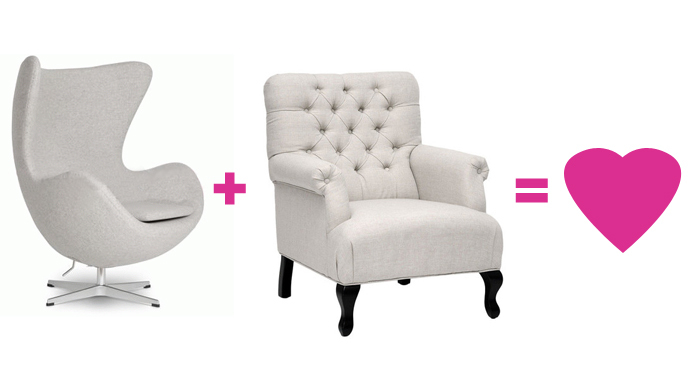 How gorgeous is that settee and wingback? The modern lucite coffee table and modern lamp don't distract because they aren't fighting for attention with the traditional elements of the room. While the picture frames are traditional in shape, the presentation and color is modern. C. EDIT and KEEP IT SIMPLE Some adages and rules stick because the work! Too much clutter and too many knick knacks are going to have your space looking dustier and mustier than a cat lady's, no matter how beautiful your accessories and furnishings. If you want one of your favorite antique lamps to shine, the worst thing you could do would be suffocate it with too many other accessories, especially of mixed styles. Win an industrial pendant light! WOODEN TUBS? YES! / FÜRDŐKÁD FÁBÓL? IGEN! Do you prefer less or more? 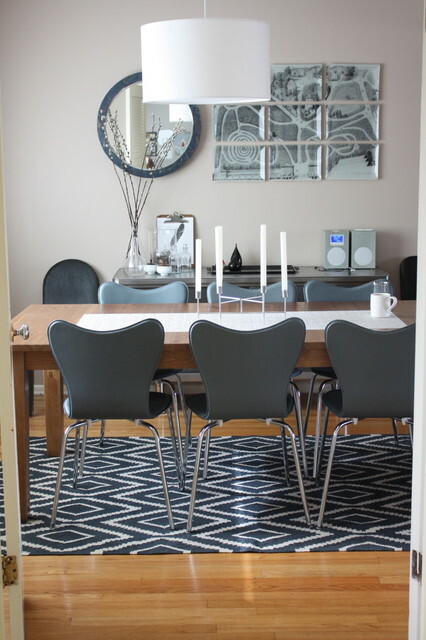 A home makeover full of glamor and comfort! SEARCH FOR THE RAINBOW! / KERESD A SZIVÁRVÁNYT!